Beacon Hill is a neighborhood in Boston, Massachusetts, that borders the Boston Common and the Boston Public Garden. It covers about one square mile and is presently home to approximately 10,000 people. It is a neighborhood of Federal-style row houses, with some of the highest property values in the nation. 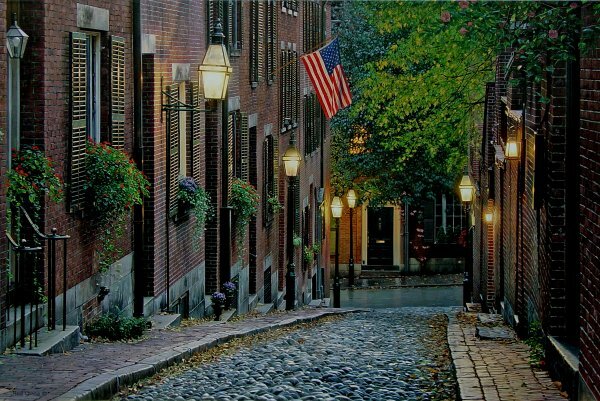 Known for its narrow streets, brick sidewalks and gas-lit streets, it has been home to many famous Americans including Louisa May Alcott, Robert Frost, John Hancock, Oliver Wendell Holmes, Henry Cabot Lodge, Sylvia Plath, David Lee Roth, Carly Simon and Daniel Webster to name a few.